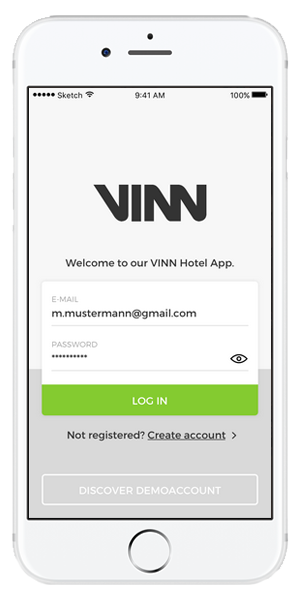 The innovative app VINN Cockpit offers your hotel guests almost unlimited possibilities. VINN Cockpit offers the most modern mobile services on the market such as mobile access to the room with a smartphone, mobile payments without waiting times and many other services. Controlling the TV and streaming content from the mobile device to the TV via VINN Cast, as well as many other options of room control and services, make VINN Cockpit the most innovative and functional software available on the market today. Our revolutionary and unique interface configuration automatically adapts the software on the guest’s smartphone to all new technical conditions. VINN Cockpit is the software that makes all IP-enabled guest technology compatible with each other meaning waiting times or interfering connection attempts are now a thing of the past. VINN Cockpit is ideally matched with all other VINN products. For the guest, unnoticeable in the background, the software will always reconfigure itself. VINN Cockpit offers the same intuitive and essential user interface, so that the guest can easily deal with changing technical environments at any time.